Ahhhh! Music to my ears. That quote was from the head coach for the Pittsburg Steelers (American football). It was in reference to a problem player who was creating a non-team atmosphere. That same quote could be scaled across all of our organizations. To me, that was a mountaintop statement; a clarion call to all of our organizations as well as our employees. Imagine a workforce that volunteered their services for 3 to 4 hours for a good thing. Volunteering is generally considered an altruistic activity where an individual or group provides services for no financial or social gain to benefit another person, group or organization. Volunteering is also renowned for skill development and is often intended to promote goodness or to improve human quality of life. 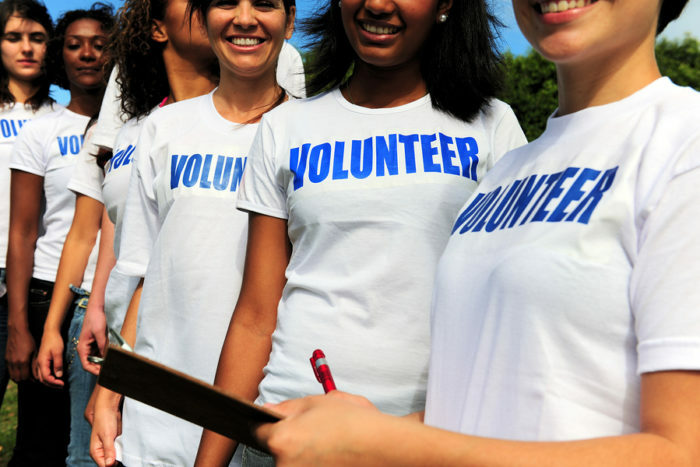 Volunteering may have positive benefits for the volunteer as well as for the person or community served. Benefit another group or organization. Check. When I read through the list of the values and rewards of volunteering, I wondered why every company and business doesn’t encourage – and support – its employees to volunteer. Of course many do, but my question is how many of our organizations live up to those 4 bullet points? Volunteering is not for financial gain, but as I have mentioned before, agreeing with the chairman and CEO of the BlackRock investment firm, we have to connect beyond the P&L. What are you doing to give back to society? How can we turn our employees who we describe as our most valuable asset into a group of volunteers? Creating a culture of volunteerism within our organizations doesn't just help others, it also helps your organizationClick To Tweet. According to a Deloitte study, employers who encourage and promote volunteering boost morale, workplace atmosphere and brand perception. The research found that an overwhelming majority (89%) of employees think organizations that sponsor volunteer activities offer a better overall working environment. 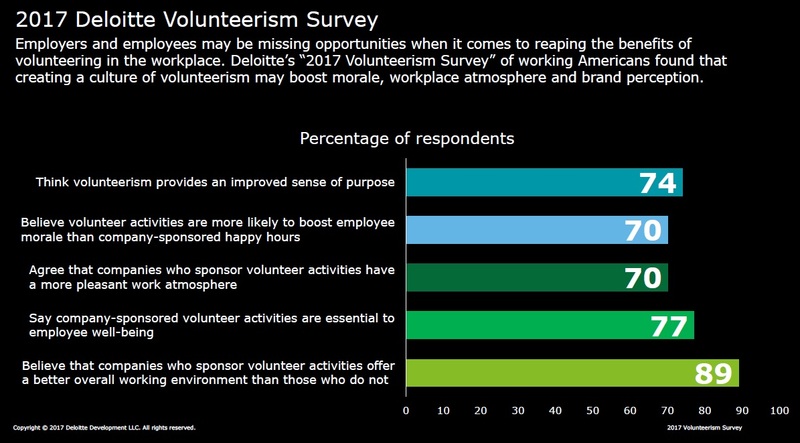 In addition, 70% believe volunteer activities are more likely to boost staff morale than a lot of the other foolishness being offered in hopes of creating a more engaged workforce. According to that same study more than three-quarters of respondents say volunteering is essential to employee well-being. Most organizations, however, aren’t cashing in on these potential benefits. Fewer than 40% of employees said their employers provide access to company-sponsored or coordinated volunteer programs. Nearly 70% of employees are not volunteering as much as they would like to, with nearly two-thirds of those saying part of the reason is because they aren’t able to dedicate any time during the day to volunteer. When I was VP of human resources at Martha Stewart Living in New York, we thrived on giving back and turning a workforce into an army of volunteers. We adopted the an arts-focused high school and our designers volunteered their time, some of which was during work hours. They judged competitions, ran workshops, mentored students, etc. Our gardening department worked with the city and turned an abandoned plot of land into a community garden. Another design group adopted a senior citizen home and would decorate their great room for every holiday. As I would tell all of our new employees on their first day, we are an organization that gives back. Every employee was given an additional 2 days of leave to volunteer in some way. The big corporate event was Operation Backpack, which was major volunteer event based in New York City. Corporations and businesses throughout the city donated backpacks and supplies to homeless kids so on the first day of school they would have a new bag stuffed with supplies. Although this model has changed over the years, during my time the vast majority of employees at our company would meet at a site and stuff bags. To see senior executives next to the employees on the low end of the org chart packing bags, laughing and building relationship was an emotional sight to see. Everyone at the end of the day was paid in goodness because we had all given to a great cause. “Employers have an opportunity to build on their volunteerism programs by creating a culture that celebrates volunteering and empowers volunteers to be more active,” Doug Marshall, managing director of corporate citizenship for Deloitte LLP, said in a statement. In addition to providing more opportunities to volunteer, employers can do a better job of making sure employees, especially younger ones, know the benefits of doing so. Three-quarters of the millennials surveyed said they would volunteer more if they had a better understanding of the impact they were making, compared to 61% of those of all ages. Are we benefiting another group or organization? Are we improving the human quality of life? Are we giving back to society in a way that inspires our employees? If you have trouble answering the above, make it a New Year’s resolution to inspire and set a volunteering example for the workforce you have. You only have them for 3-4 years anyway — if that much — but make that time count as a valuable volunteer experience.